You measure more than 1m75 (5'8 '')? Here are finally dresses perfectly designed for long legs ! Wear without moderation, day or evening. They are adapted to highlight the silhouette of tall women ! For summer or winter, find your style ! 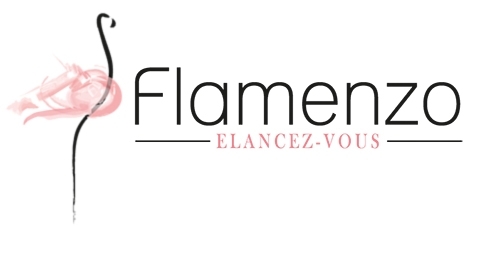 They are adapted to highlight the silhouette of the great women and have a sleeve length of at least 70 cm! 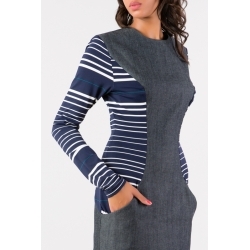 Stripe dress with stripes and beiges that marries the morphologies thanks to its cutting officer. An original dress that is easily worn: Working girl with heels or sport with sneakers, it adapts to your mood of the day. Large pockets on the sides that fit into the curved cut of the dress. Round neckline and a drop-down closure in the upper back with a small silver button. Dress gray pearl sweater round neck with a removable scarf collar. Long sleeves and a soft material for this timeless basics! 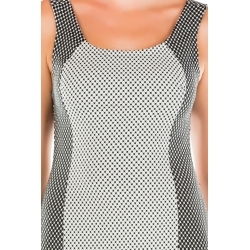 Trendy bi-material dress with trendy geometric shapes. The back and the sides of the dress are in elastic jeans. A pattern that brings a touch of originality to a classic shape. Our model is 1m85 and is wearing size S.
Model's height : 1m85 (6'06”), Size M ""